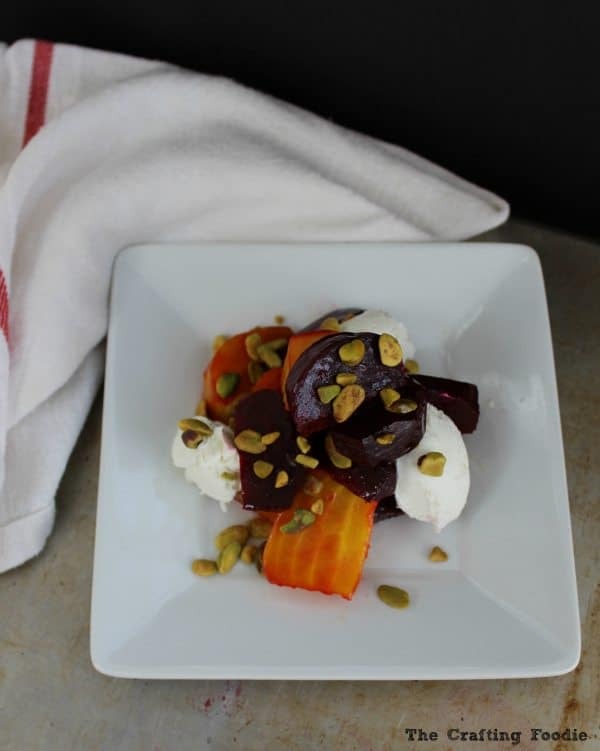 Sweet, tender roasted beets are paired with tangy, whipped goat cheese to make this hearty, healthy Roasted Beet Salad with Whipped Goat Cheese. You can make it ahead of time, and put it together in a just a few minutes. 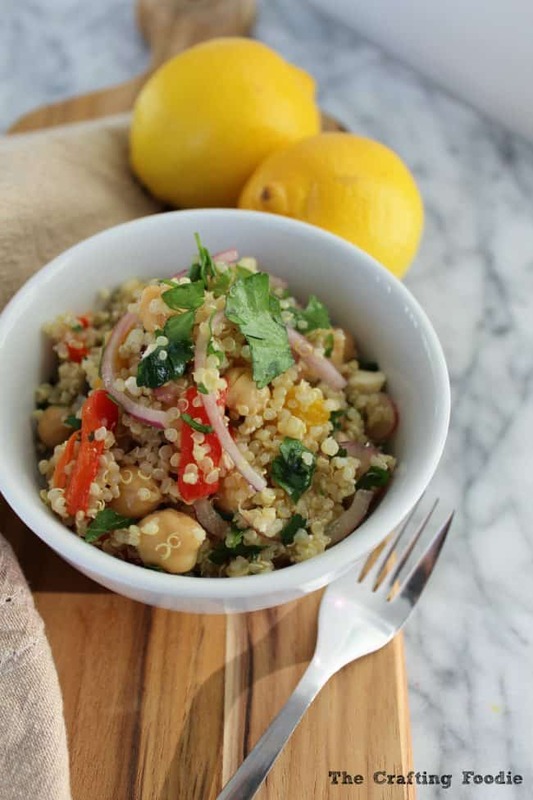 It’s the perfect winter salad to help you get back to healthy eating after the holidays. Hi Everyone! It’s Aida from The Crafting Foodie, and I’m sharing my beloved, go-to winter salad: Roasted Beet Salad with Whipped Goat Cheese. Now that the holidays are coming to a close, I really make an effort to get back to my regular eating routine which means fewer desserts and more vegetables. While I love a green salad tossed with whatever I have in the fridge, in the winter I struggle to eat just leafy greens. Since I live in New England, and the weather is getting colder by the minute, and the threat of snow seems to be lingering in the air, a green salad just doesn’t cut it for me. I need something that’s hearty, satisfying and filling. 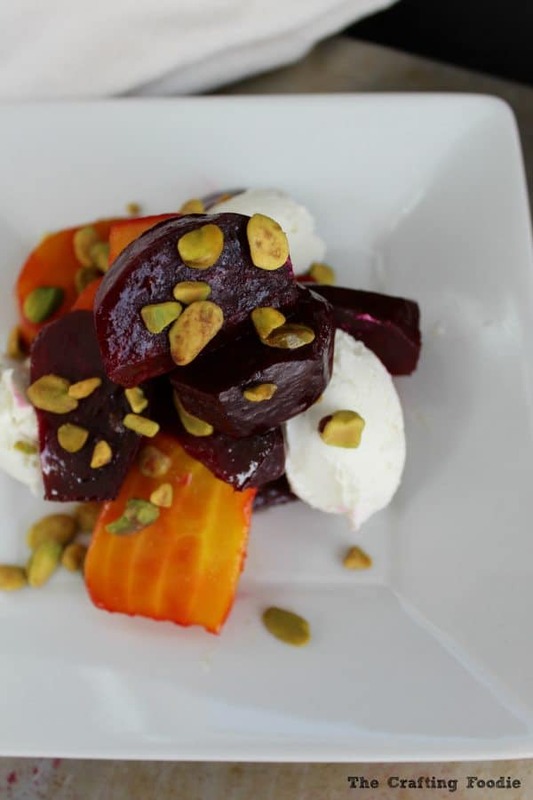 And this Roasted Beet Salad with Whipped Goat Cheese is exactly that. The most challenging part of the recipe is roasting the beets. My preferred method of roasting beets is in the oven. You can boil them if you’d like, but the one thing I would NOT recommend is buying pre-roasted, canned beets. They lack the full-bodied flavor of beets that you roast on your own. And since the roasted beets are the main attraction in this salad, we’re looking for the sweet, subtle earthy flavor that roasting beets at home can only bring out. While you certainly can eat the beets, cheese, and nuts alone, I often add a handful of baby kale or spinach to the salad. My perfect bite is to get a few greens on my fork, a chunk of roasted beet, a few nuts, and a smudge of the whipped goat cheese. 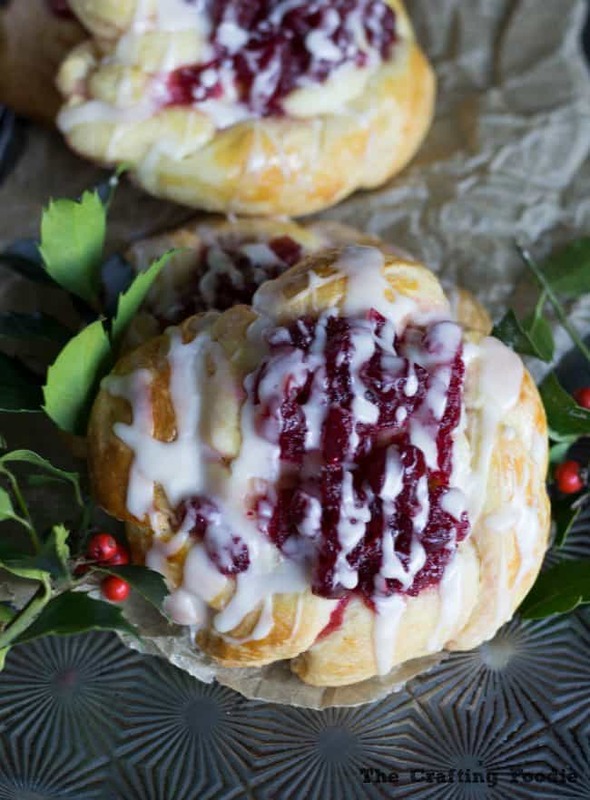 It’s sweet, salty, crunchy, creamy, tart, and crisp all in one perfect bite. 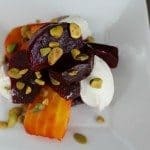 So if one of your post-holiday and New Year’s resolutions includes eating healthier, you need to include this Roasted Beet Salad with Whipped Goat Cheese to your weekly menu planning. Hopefully it will end up being one of your favorites, like it is mine! 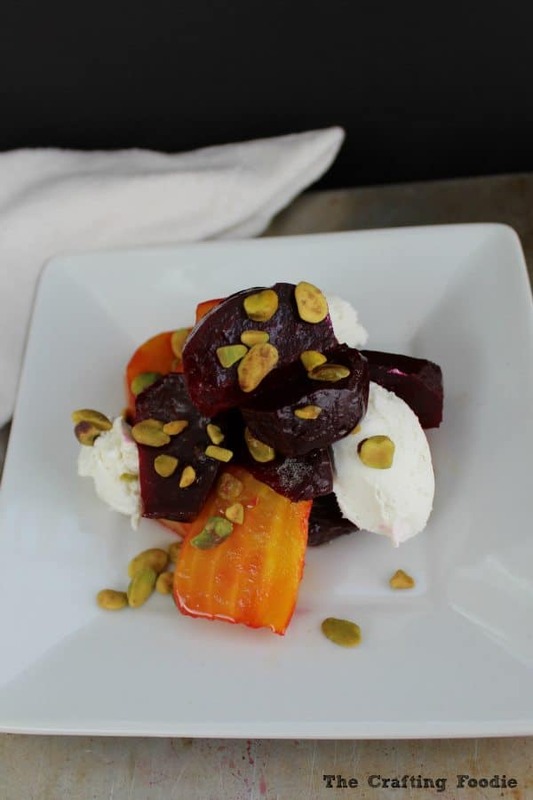 Sweet, tender roasted beets are paired with tangy, whipped goat cheese to make this hearty, healthy Roasted Beet and Whipped Goat Cheese Salad. You can make it ahead of time, and put it together in a just a few minutes. It's the perfect winter salad to help you get back to healthy eating after the holidays. Preheat the oven to 350 degrees F. Trim the beets of their greens. Wash them thoroughly. Wrap each beet in foil. Place beets on a sheet pan, and bake for about 1 hour. You know they are done when they are tender enough to easily insert a knife into them. Remove them from the oven. 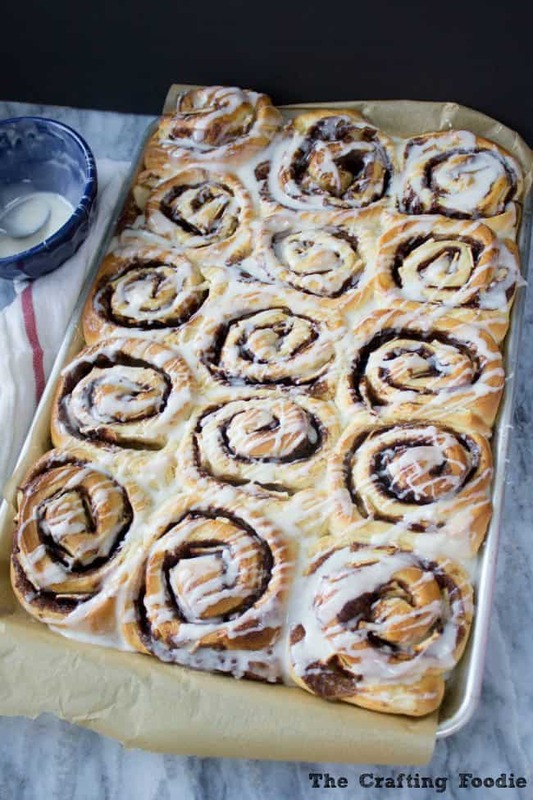 Allow them to cool slightly. Unwrap the beets. Peel them. Chop them into large chunks. Whisk the dressing ingredients together. Set aside. Place the goat cheese, salt, pepper, and olive oil in a bowl. Using an electric mixer, whisk until fluffy. Place the beets in a bowl. Drizzle over a bit of the dressing and toss. In a larger bowl, dress the greens with some of the homemade dressing. Place the greens and beets on a plate. Sprinkle with nuts. Using two teaspoons, form about 4 ounces of whipped goat cheese into small balls. Place cheese on salad and enjoy. 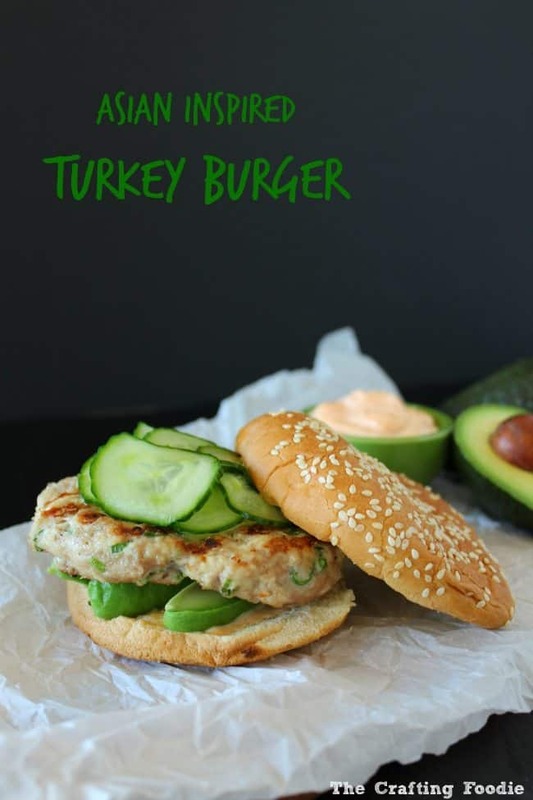 If you’re looking for more healthy meals and some sweet treats, check out The Crafting Foodie for more. You can follow me along at The Crafting Foodie or on Facebook, Google+, Instagram, Pinterest, and Snapchat (@CraftingFoodie).